Sunscreen Poisoning is the accidental or intentional intake (swallowing) of any product containing the compound. What are the Causes of Sunscreen Poisoning? Mineral filters: Zinc oxide, titanium dioxide, etc. Chemical filters: Agents such as oxybenzone, avobenzone, salicylates, etc. What are the Signs and Symptoms of Sunscreen Poisoning? The signs and symptoms of Sunscreen Poisoning can vary from one individual to another. It may be mild in some and severe in others. Several systems of the body may be affected. How is First Aid administered for Sunscreen Poisoning? Who should administer First Aid for Sunscreen Poisoning? 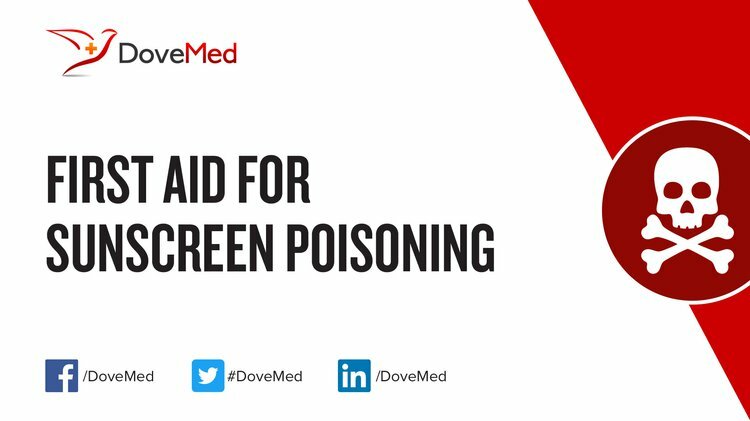 First aid for Sunscreen Poisoning is administered by healthcare professionals. What is the Prognosis of Sunscreen Poisoning? How can Sunscreen Poisoning be Prevented? Beny, R. U. B. (2013). U.S. Patent Application No. 13/832,551. Thunga, G. (2014). Association of Severity Assessment Tool with the Outcome of Organophosphorus Poisoning in Tertiary Care Teaching Hospital. Value in Health, 17(7), A792. Wasserman, M., & Lee, C. (2014). Understanding the Need and Value of Surrogate Endpoints for Health Care Decision Making in Asia Pacific. Value in Health, 17(7), A792. Long, E., Hu, M., Tong, R., & Qin, Y. (2014). Cost Analysis Of Pharmaceutical Service In Hospital: A Case Study In A Tertiary Hospital In Sichuan, China. Value in Health, 17(7), A792. Unurtsetseg, C., Delgermaa, V., Tsevegdorj, T., Gantuya, B., & Odongua, N. (2014). Quality Of Hospital Food And Its Safety Assessment. Value in Health, 17(7), A792. Prevention, P. I. (2013). A. suffocation. B. poisoning. C. sepsis. D. falls. Journal of Emergency Nursing, 39(1). Ji, Y., Zhou, L., Ferronato, C., Salvador, A., Yang, X., & Chovelon, J. M. (2013). Degradation of sunscreen agent 2-phenylbenzimidazole-5-sulfonic acid by TiO 2 photocatalysis: kinetics, photoproducts and comparison to structurally related compounds. Applied Catalysis B: Environmental, 140, 457-467. Downs, C. A., Kramarsky-Winter, E., Segal, R., Fauth, J., Knutson, S., Bronstein, O., ... & Pennington, P. (2016). Toxicopathological effects of the sunscreen UV filter, oxybenzone (benzophenone-3), on coral planulae and cultured primary cells and its environmental contamination in Hawaii and the US Virgin Islands. Archives of environmental contamination and toxicology, 70(2), 265.